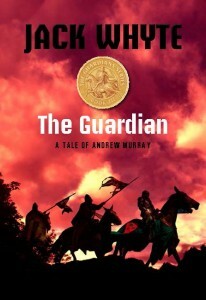 Every time I find myself talking about The Guardian, I want to call it the book that never should have been, because when I sat down, some time in late 2011 or early 2012, to do the initial research that would grow into the novel, I had no idea that I was about to go driving off into La-La-Land, in a direction I had never even thought about, prior to that time. The book I thought I was going to write, because it seemed like a natural progression in the overall saga of the 13th Century Scottish War of Independence, was about Sir James Douglas, who has been idolized for centuries by the Scots. Known as The Black Douglas, but more familiarly as The Good Sir James, he was a brilliant and charismatic military genius, a James Bond-style hero who, though almost a decade younger than Robert the Bruce, quickly became the king’s most trusted friend, closest confidant and most able general. What came out instead, though, was a tale of Andrew Murray, and it completely destroyed my ability to write the trilogy I had visualized it until then, because Murray wasn’t even supposed to be a part of the equation, which had had only three parts: Wallace, Bruce and Douglas. But of course Andrew Murray was a part of it, a crucially important part that I had never really been aware of, because his story was eclipsed by Wallace’s shadow in the aftermath of the Scots victory over the English army at Stirling Bridge, and the mushrooming hugeness of the Wallace Myth in the centuries that followed had led to a situation in which Murray, and his importance as the co-leader of the Scots army in the battle at Stirling had been largely ignored and barely acknowledged by anyone before the turn of the current Millennium. One eminent and outspoken Scots historian, however, spoke up on Murray’s behalf in a book that was published in 1914. His name was Evan Macleod Barron and the book was The Scottish War of Independence. The volume was republished in America by Barnes & Noble in 1997 and I discovered it when I started researching this series in 2012 and found a reference to the work in my primary source, the definitive book on Robert the Bruce written by Geoffrey Barrow, Professor Emeritus of Scottish History and Paleography at the University of Edinburgh. Further research revealed that Barron was the first established academic to suggest that, had Andrew Murray not been fatally wounded in the Stirling fight, the history of Scotland might have been different and William Wallace might not have achieved the legendary status he enjoyed for centuries. The idea rattled me, for it seemed like heresy, after having lived with the Wallace legend all my life. And so, instead of railing against Dr. Barron’s opinions (as other have) I started doing my own research, and shortly after that I acknowledged to myself that here was a story that I had to tell—a story that I had not known was there to be told. And so, in the next few pages, I would like to invite you to meet young Andrew Murray, Guardian, and Joint Commander of the Armies of Scotland. To do that, though, we have to go back and see the tale again through the eyes of Will Wallace’s cousin, Father James Wallace, secretary to Robert Wishart, the Patriotic Bishop of Glasgow.